If you have a voice, you can sing. While that knowledge alone won’t help you hit higher notes, or learn to sing with more power, it’s still the starting point for everyone that wants to learn to sing. And while you may not be a great singer yet, it’s possible for anyone to gain the skills that make an amazing singer. The truth is that singing is a skill like any other. And like any other skill, there are some singing techniques that help improve your voice more quickly than others. So don’t buy into that “You’re either born with it or you’re not” crap. All you need is a bit of insider information about how to get the most out of your voice. In my years teaching singing, I’ve noticed that some singing techniques work better than others. So today let’s discuss Ten Singing Techniques to Improve Your Voice. More control over their voice. Getting more control of your voice means increasing range, hitting higher notes, and gaining confidence. 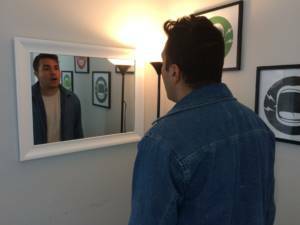 So what’s standing in the way of you getting control over your voice? There are many factors, but the most common problem singers have is cracking and straining when singing from the bottom to the top of their voice. We all know that singer that sounds great low, but only has a breathy falsetto on those high notes. What causes this crack as you sing from low notes to high notes? The voice strains or cracks when there’s an imbalance between the vocal registers. So let’s talk about the vocal registers and how the right singing techniques can help. A vocal register is a series of notes that share a similar sound and texture in your voice. 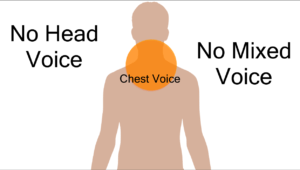 Chest Voice and Head Voice. Chest Voice refers to the notes at the bottom of your range. They all share a similar strong, brassy sound. When you hear the term Chest Voice, think Amy Winehouse or Johnny Cash. They have so much bottom end on those low notes. On the other end of the spectrum, Head Voice refers to the notes at the top of your range. Head Voice notes all share a flutey, breathy and angelic sound. Think Sam Smith or Mariah Carey when they sing in falsetto. Now that you know the different vocal registers, let’s look at how we can use them to sing better. What are Your Singing Issues? 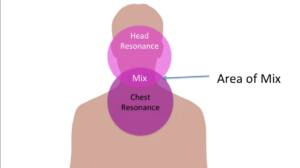 Most vocal problems are caused by an imbalance between the chest and head voice. For instance, maybe your lowest notes are breathy and lack strength. Or maybe as your start to sing higher, you go flat and strain. Or worse, you crack into falsetto every time you sing a high note. 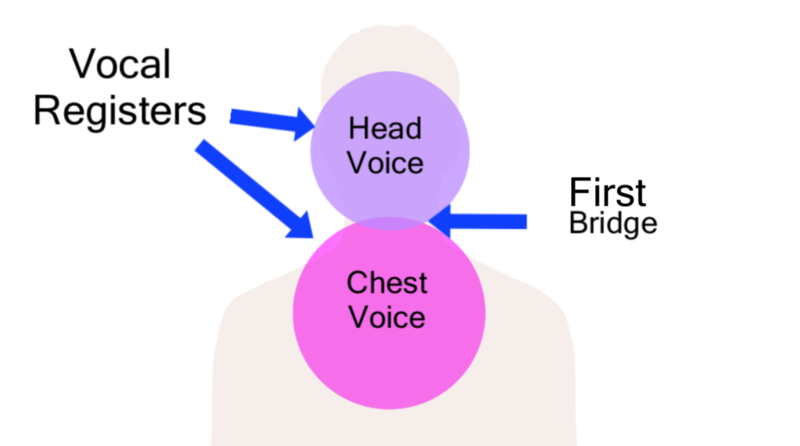 Each one of these vocal problems comes from an imbalance between the chest voice and the head voice. Many singers will try to sing through these problems or even hide them. But trying to muscle through your vocal problems can actually make them worse. Of course, the first temptation is to sing that problem note over and over until you get it right. But that only reinforces what was wrong in the first place. By learning singing techniques that balance the registers, you will progress much more quickly. So what are the right singing techniques for your voice? Most people start by singing songs and trying to get them perfect. But singing songs without using the right singing techniques is very difficult, and can actually hold you back. That’s because songs have so many moving parts. The vowels, the consonants, rhythm and dynamics. Songs are literal moving targets of singing and emotion. And they’re all trying to screw you up. Of course, eventually we need to sing songs. But the best way to gain control of your voice is to work with singing techniques that help you sing the part perfectly in the first place. And then do it in a song. How do you gain this kind of control over your voice? Control over your voice comes from learning to balance the vocal registers. And the best way to balance the vocal registers is to learn to sing with a mix. Singing with a mix means singing with a blend of chest voice and head voice on every note in your range. 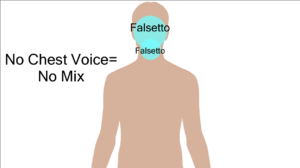 For example, if you can only hit high notes in falsetto, that means you’re singing in pure head voice. Or if you strain and go flat as you sing higher, that means you’re probably singing with too much chest voice. But what if you learned to add a bit of chest voice to those high falsetto notes? Or what if you learned to let in a bit more of your head voice on those strainy, flat notes? You would end up with a mix of the different registers. Learning to sing with a mix would help you eliminate the cracks in your voice and sing stronger across your whole range. And with that strong and resonant voice, you’ll have the power to sing any note you want, whenever you want. Not all vocal problems are created equal. In fact, every voice has its own specific challenges and needs. However, there are many singing techniques that tend to work for almost any voice. When done correctly, they can help anyone to sing better. That means singing stronger and higher than ever before. If any of the following singing techniques feel uncomfortable or hurt, you are doing them wrong. We may make some funny noises, but nothing should hurt. I know it’s tempting to sing through the pain, but pain is a sign that something is wrong. It’s just not worth pushing your voice to do something it doesn’t want to for a few extra notes. With singing, everything impacts everything. Your posture is no different. And it’s the best place to start. Singing with the right posture is just as important as singing on pitch and breathing from the diaphragm. Without one of these elements, the whole system falls apart. As we’ll see in the next section, the correct breath for singing is called a diaphragmatic breath. But the diaphragmatic breath starts with the correct posture. It requires that your stomach expands on the inhale and contracts on the exhale. In order to breathe correctly, you must first have proper posture. The right posture for proper breath support is a Tall Posture. 1. Stand up and spread your feet so they’re evenly spaced on the ground in line with your shoulders. 2. Your hips should be even above your feet. 4. Your neck should be resting gently above your shoulders. Keep your gaze forwards. Not towards the ceiling or down to the ground. To make sure you’re doing it right, watch yourself in a mirror. Now imagine two straight lines shooting down from your shoulders to the ground. Your shoulders, hips and feet should all be in line. If you’re doing it right, you should feel like you could jump onto a moving train. Also, don’t worry if you’re having a hard time finding the right posture. Check out this video. It’ll guide you to find the correct posture for singing. I’ve written an article discussing diaphragmatic breathing that includes the Ultimate Breathing Warm Up. But for those that are new to the concept, there are lots of different ways to breathe when you sing. However, the most efficient breath is called Diaphragmatic Breathing. That means that when you inhale the diaphragm contracts, expanding your stomach outwards. When you exhale the diaphragm will relax, bringing your stomach back in. The diaphragmatic breath is the most efficient type of breath you can take for singing. You get the maximum volume of air, plus the muscular support you need in order to use it correctly. And if you’re keeping a tall posture, you should already be perfectly set up for this breath. 1. Use a mirror to help you make sure that the top half of your body is totally still. 2. Then place your hand on your belly and take a slow inhale through your mouth. 3. With your hand on your belly and without forcing it, allow the inhale to expand your stomach outward. 4. Then when you’re ready, exhale and allow your stomach to retract. IMPORTANT: There should be no movement in your shoulders or chest. It should all be from the low stomach. Now that we’ve got our posture and our breathing right, let’s cover the most important aspect of how to improve the voice: relaxation. When you’re learning to sing high, it’s incredibly important that you are comfortable. There’s no point in stretching your voice to do something it doesn’t want to do. It’s a common mistake to push too hard just to get a few extra semi-tones. Learning to care for your voice is part of being a singer, so start now and take your time with these singing techniques. Now, if you’re singing with the correct posture and breathing from the diaphragm you should already be in the best position to avoid tension. If you notice yourself slouching or running out of breath, go back to the last two sections and fix those first. Always remember: If you feel any pain when singing these warm ups, STOP. Some of the exercises we cover today may feel a little strange to you, but none of them should hurt. Watch yourself doing these warm ups in the mirror to ensure there’s no tension. If you see any grimacing or wincing when you sing, you’re doing something wrong. You should be able to sing all these exercises with a relaxed facial expression. Try to keep those funny sounds in the throat, not on your face. Every good work out starts with a warm up. When you’re learning a skill that requires a lot of coordination like singing in a mix, a warm up is absolutely necessary. So before we sing songs, we need to warm up. This is for the simple reason that it’s just too easy to make mistakes if you’re singing a song cold. And since singing with a mix is all about gaining control over your voice, the warm up is the best place to get started. The first step in getting your voice warmed up is making sure you have a strong chest voice. Many singers tend to sing breathy and light at the bottom of their voice. That’s because order to sound beautiful, they think they have to sing breathy. But if your voice is light and breathy on bottom, you don’t have a chance of singing high notes with power. As we discussed earlier, the chest voice is the vocal register responsible for all the notes at the bottom of your voice. But even more important, the chest voice is also the foundation for all the notes that come above it. In my experience, the best way to strengthen your chest voice is to use the power of your speaking voice and apply it to singing. It may sound strange, but many people who have a strong speaking voice sing too lightly. Remember that most vocal problems come from an imbalance of the vocal registers. So if your chest voice is weak, then the whole range will be weak. But what would happen if you applied the same strength you have in your speaking voice to your singing? You would end up with a strong, resonant chest voice and a solid foundation for your higher notes. The first exercise we’ll use to strengthen our voice is the 5-Tone Count. Check out this video demonstrating the exercise. It also includes the male and female friendly keys of the scale so you can practice along. · The whole point of the 5-Tone Count is to match the strength of your speaking voice to your singing voice. So make sure there’s no breathiness in your voice as you count out loud. · It’s totally fine to speak/sing these notes. They may even sound ugly to you. We’re not trying to sound pretty. We’re trying to get the full power of your chest voice on the notes. · Stay at a consistently strong volume. Finding the right volume can be a tricky thing. Some singers sing too softly which makes your voice more likely to crack. Other singers yell, which limits your range and often makes you sing flat. So we need to find a suitable volume for singers of all kinds. 2. Now sing the notes at a volume where you could reach the back row. 3. Do this without yelling and without whispering. The result should be a comfortable but loud and resonant tone where you could still be heard in the back row. Now that we’ve got a loud and resonant chest voice, let’s start to expand our range to both registers. The lip trill is the safest and most powerful exercise to expand vocal range. In this exercise the vocal folds are in a close, safe environment. This decreases the threshold force needed to get the vocal folds to vibrate together. That means the Lip Trill helps you sing those top notes with your registers in a Mix, rather than singing them in falsetto. In addition to helping you expand your range safely, the lip trill is also great at ensuring a steady volume when you’re singing scales. You can think of the lip trill as a compressor on your voice. It boosts the notes that you would normally sing in falsetto, and reduces the strain on the notes you might yell. This should be done in a very relaxed way. Make sure that you’re not straining or “pushing” the air to get the lips moving. Just relax the lips and let them gently vibrate together. If you’re having a hard time getting the lips to trill together, try saying “Buh, Buh, Buh” quickly in order to draw your lips together. Then try blowing some air between your lips while maintaining the “Buh” feeling of the lips coming together. If you don’t have a piano handy, don’t worry. Here’s a video demonstrating the exercise in all the male and female keys so you can sing along. · The whole point of the lip trill is to keep an even tone across your whole range, so make sure that your volume stays consistent when singing from bottom to top. · The lip trill also trains your voice to sing with a consistent amount of breath across your whole range, so keep your lips flopping evenly. · Remember to sing the vowel “Uh” as you’re doing the lip trill. Your tongue should remain flat and in the front of your mouth. The next warm up we’re going to do is closer to singing than the lip trill exercise since it is more “open”. Sure, the lip trill is great for singing high notes without falsetto or strain, but it doesn’t sound that much like actual singing. So let’s open things up a bit. Unfortunately, opening our mouths to sing also means we are losing the advantage of the lower threshold required to keep the vocal folds together like we had on the lip trill. But with a “Gee”, we’ve still got a lot of things going for us. First, the “ee” vowel promotes stretch in the vocal folds, which allows you to sing higher. And second, the “G” consonant brings the vocal folds together which allows us to keep our registers connected in a mix. Just try saying “Guh Guh Guh” and you’ll see what I mean. The feeling you get when singing that glottal “G” consonant is the feeling of the vocal folds closing. This ensures an even volume. Put it all together and you’ve got a recipe for hitting all sorts of notes in your range without falsetto. 2. While saying the word “Gee”, make sure that you are annunciating the “G” consonant. Again, don’t worry if you can’t read music or don’t have access to a piano. I’ve arranged these exercises in all the appropriate male and female keys in this video. Now that you’ve sung across your whole range, let’s start to isolate some of the harder notes in the middle of your range. This is probably the most famous Speech Level Singing exercise for expanding range. And it’s for two reasons. Now while the Bratty “Nay” has a very ugly sound compared to the Gee, it can help you hit high notes with more power than the “Gee” for a few reasons. First, the bright, bratty sound we’re going to use keeps the vocal folds together, which keeps the registers connected. Second, the “ay” vowel promotes stretch in the vocal folds which allows for more head voice. Finally, the “N” consonant is excellent at resisting the air from your lungs, helping you hit high notes with a mix. But the “Nay” is more open than the “Gee” which increases the chance that we might flip as we sing higher. There are lots of open vowels on songs so this is good training for the real thing. So all told, yes the bratty “Nay” sounds horrible but it is closer to real singing, since it’s more open. It may feel like you’re squeezing something in your throat. But remember, if you feel any pain or discomfort, you are doing something wrong. · The biggest benefit of the Bratty “Nay” comes from the bratty sound. · If the sound isn’t right, the exercise won’t work and may actually cause strain. So tread lightly. · Keep the scale at a comfortable volume like we discussed above. However, focus more on the bratty sound itself than getting a lot of volume. · The volume will come if you’re doing the bratty sound correctly. · If you’re having trouble finding the bratty sound, go back to the Wicked Witch video and try again. Next we’ll start to sing higher notes on slightly less funny sounding exercises. The Bratty “Nay” exercise is great for expanding your range and helping you sing in a mix. After all, nobody wants to hear you singing on stage with a bratty sound. So let’s work with another singing technique to get a more performance-ready tone. The Octave Repeat “No” exercise keeps all the great stuff about the bratty “Nay” but sounds a bit closer to real singing. Like the “Nay”, the “N” consonant allows the vocal folds to close. But unlike the “Ay” vowel, the “Oh” allows the larynx (or voice box) to relax a bit. This creates a much more relaxed sound. Feeling relaxed is mandatory for learning to sing in a mix. · You may find it helpful to incorporate a little bit of the “bratty” sound into the “No”. This can help the voice connect to the mix. But tread lightly. The whole point of the “No” exercise is to hit these high notes with a more normal sound. · As you’re singing to the top of the scale, avoid the temptation to spread the vowel wider than the “Oh” (like in “Note”). Just keep the “oh” vowel narrow as you sing towards the top. Now that we’ve got our registers balanced and our tone is starting to sound more normal, let’s get even closer to the real deal of singing. The Octave and a Half “Mum” is the big daddy of vocal exercises. Until now, we’ve been working with exercises that give you a lot of support mixing your vocal registers. But the “Mum” exercise can screw you up. I’m not doing this to be mean. The “Mum” exercise is the closest technique to singing a real song. In this case the “M” consonant gives you less support than the “N” in the previous exercises. Also, the “Uh” vowel relaxes the vocal articulators (tongue, lips, palate). Usually the articulators help you find a mix more easily. But in the “Mum” exercise, we’re taking them away. 1. Begin saying the word “Mum” (as in “Mummy”) aloud at a comfortable volume. As always, if you have any trouble with the exercise, check out this video. It includes male and female keys so you can sing along. · The Mum is the hardest exercise listed in this article. If you’re having a hard time with it, return to an exercise that worked well for you and then try the “Mum”. · Keep your mouth spread to the same width as when you say the word “Mum”. Watch yourself say this word in the mirror and make sure it doesn’t spread as you ascend in the scale. Because of its open nature, it’s too easy to widen the “Uh” vowel and yell your way to the top. · If you find yourself crack on notes as you sing to the top of the scale, focus your attention on the “M” consonant. It will help you blend your registers in a mix. Thanks for reading this tutorial on singing techniques. You should be able to hit higher notes in your range with your registers connected. That means you’re singing high notes without strain or falsetto. But if you are still having trouble, don’t worry. Singing all the notes in your range with a mix is a skill that takes time to master. The vocal exercises included in this article will certainly help. So if you’re ready to begin your journey to a more beautiful voice, feel free to Book a Free In-Person Lesson or Free Skype Vocal Evaluation. The bonus video contains all 10 Singing Techniques, laid out in order with exercises for each. That way, you can improve your voice easily today! I have had a couple of in person sessions with Matt and have watched this video including each of the videos contained in it, and I have found all of them easy to understand and each of them most helpful. Thumbs up! Thanks for your message Joe. I’m so glad you found them helpful! Thanks Martincal! Keep up the great work.